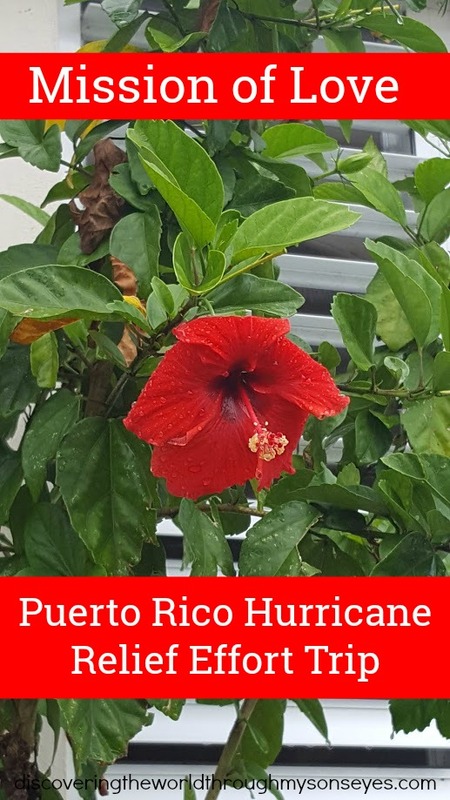 On September 20th Puerto Rico was devastated by Hurricane Maria. On October 27th, exactly one month and a week later I traveled to Puerto Rico to bring provisions to family and friends on a Mission of Love: Puerto Rico Hurricane Relief Effort Trip. Puerto Ricans in the diaspora with a mission of love. At the airport, I realized I wasn’t the only one lugging boxes and suitcases of provisions. I spoke to a few people who were on the same mission that I was on! To bring to their loved ones some relief. We joked about how heavy our bags were, and how batteries are a hot commodity in Puerto Rico. We weren’t strangers talking. We were Puerto Ricans in the diaspora sharing one thing in common: to help our families. That Friday afternoon when I arrived in San Juan things “looked normal.” The city has power. I waited for my cousin who was flying in from Connecticut, and we both rented a car. We started our journey to the north western side of the island towards Florida my hometown and where all our family lives. In San Juan the traffic lights were working, and traffic was crazy. A few things we saw along the way, was a sense of patriotism and love displayed with flags on cars, buildings and homes. Billboard signs with “Puerto Rico se levanta”, “Oraciones para Puerto Rico” and “Unidos por Puerto Rico”, and on street corners there were vendors selling flags. However, things were far from being normal as we left the “area metropolitana” (city area) behind us and we were getting closer to home. Out in the countryside there’s a stark contrast from the city. Things looked different. There is no power, trees are bare, and there are damaged homes, and piles of furniture, mattresses, and trash along the sidewalks waiting to be picked up. We saw many electrical poles hanging sideways, trees pulled from their roots, and policemen at main road crossings directing traffic. At sunset they leave, and there is no one to help. Of course, except for the various tow trucks parked on the corners waiting for an accident to happen. It’s scary trying to get across with no working traffic lights, and everyone trying to get through. We continued to see electrical poles slanted on the side, some barely being held up by the electrical cords. We saw some houses without roofs with only a blue tarp covering them. Others were abandoned by their residents. How is life in Puerto Rico now? For the lucky ones with gas stoves they are able to cook at home. For others, “al fogón” (open fire) or on a grill. Grocery stores are open but with a limited schedule they open at 11 a.m. and close before sunset. Meats that are purchased at the grocery store need to be cooked right away, and eaten on the same day. Against my wishes, my Mom cooked some chicken and arroz con gandules (rice with pigeon peas). Washing clothes by hands is a chore in itself! Many have wash boards, and others like my Mom have a washing area that my stepdad made for her (it’s a bunch of empty sinks set up on wooden boards). When the sun sets many sit out on their porches or go out and talk to their neighbors. Others sit inside their homes with a flashlight or candle light read a book or just simply sit around to chat. A little while later they go to sleep with the humming sounds of neighbor’s generator, and the chirping sounds of the coquís. Outside it is pitch black! All in all, they are living day-by-day. My cousin and I had both collected donated items. We made “goody bags” that included personal care items, sanitizing wipes, water purification tablets, mayo packets (you would not believe how excited they were about these), coffee, oatmeal, batteries, and more! We donated to a total of 10 families! All thanks to the generous donations of many. It lifted our hearts to see the reaction when they felt the breeze of the fan for the first time in weeks, the grinning smile of the unexpected gifts, the “ooohs and aaahs” of how the solar panel can charge a cell phone or a solar bulb, the sense of relief of receiving a much needed mosquito net to sleep at night, and the tears of joys because someone, a stranger had remembered them. Every single one of them were truly appreciative and expressed their gratitude with hugs; and a message to all the donors: ¡Gracias! Thank you! Puerto Ricans are altruistic by nature. Kind and compassionate even in the face of adversity. They are resilient people, with a strong spirit, and even greater faith. Although the trees are bare we saw new leaves sprouting with a beautiful green color … a sure sign that things will be all right. That after the storm the sun always comes out and shines. In spite of the fact that help has been slow, there are emergency crew members, and linemen flying in every day to help our beloved island. I pray the government and the powers that be can reestablish power very soon. We crossed the ocean to bring some relief to families and friends back home, but what we really gave them was HOPE. Hope that they are not forgotten. It think is it wonderful what you did. I also think it is heartbreaking that the people of Puerto Rico are going through this. I sent “goody packages” to my uncle also. I plan on sending a few more boxes with some provisions as well as flying there after the New Year. My uncle lives in Arecibo. They have light and water but the people in the surrounding areas are still without. My uncle’s neighbor volunteers at the Salvation Army and he has taken the goody bags there for the people in need. Everyone was very grateful. Puerto Rico will once again be the beautiful and enchanted island it once was. I commend all the generous people and the hard work they’ve put into helping the people of Puerto Rico. Maria thank you for your kind words. There’s still so much to do! I also plan on returning to Puerto Rico next month. I had my tickets months ago and thankfully my Mom now has power. However, others living in surrounding areas don’t. Safe travels!